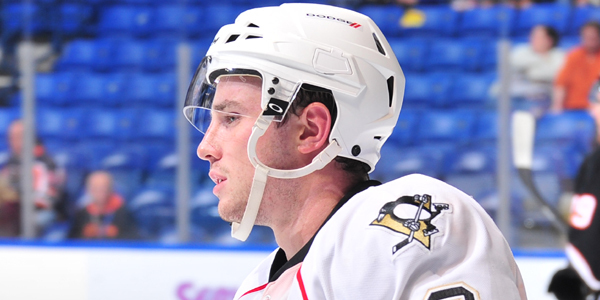 WILKES-BARRE, Pa. – The Wilkes-Barre/Scranton Penguins mounted a third-period comeback to defeat the Hershey Bears, 4-2, in preseason action at Mohegan Sun Arena at Casey Plaza on Saturday night. Down 2-1 heading into the final frame of regulation, the Penguins put 17 shots on net and scored twice on the power play in the third period to win their final exhibition game on home ice. Shavertown native Patrick McGrath opened the scoring at 5:39 of the first period, his first ever goal in a Penguins uniform. Ten minutes and 30 seconds later, Jakub Vrána fed Dustin Gazley with a cross ice pass and Gazley finished the play, tying the score at 1-1. Gazley later became the set-up man for Hershey’s second tally when he found Hubert Labrie in the slot on a goal that gave the Bears a 2-1 lead at 10:16 of the second period. The Penguins then scored two consecutive power play goals to take back the lead. Oskar Sundqvist tied the game at 6:39 of the third period, and Reid Gardiner made it 3-2 for Wilkes-Barre/Scranton 3:54 later. Tim Erixon sealed the victory for Wilkes-Barre/Scranton with an empty-net goal with 1:11 remaining in the third period. 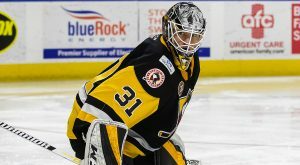 Casey DeSmith was in net for the Penguins for the entirety of the game and stopped 24 of 26 shots faced. Hershey’s Joe Cannata made 32 saves in his effort. The Penguins take on the Bears again in their final game of the preseason tomorrow, Sunday, Oct. 9 at Giant Center at 5:00 p.m. Wilkes-Barre/Scranton’s next home game is the 2016-17 season opener next Friday, Oct. 15, 7:05 p.m. against the Hartford Wolf Pack.